Buy Pabkins a Coffee. ko-fi.com/pabkins - Ko-fi ❤️ Where creators get paid by fans, with a 'Buy Me a Coffee' button. Fantasy and Science Fiction artist shamelessly fueled by caffeine. I try to give my art a touch of whimsy and storytelling. Founder of the #ATCitupwithfriends art community on instagram. I specialize in watercolor and illustration markers and now dabbling in digital. All of my art is available as originals or prints. Thank you so much for your support! Your support goes towards maintaining the art community I run and helps me produce cool art products like stickers, prints, stationary, pins, plush and so many other things so I can live the freelancer artist dream! ❤ Goals! ❤ I'll be setting goals here on Ko-fi and each time I reach the current goal I will do a giveaway of an original ACEO card by me! Everyone’s name who helped reach the goal will go into a raffle! ❤ If you'd like Happy Mail from Pabkins! ❤ - Please see the commissions area or become a monthly supporter. Learn about rewards below! ❤ Monthly supporters info! - access to patron only posts! - $1 ★ Thank you so much for supporting me and the ATC It Up with Friends Community - $2 ★ Easy automatic way to pay your monthly ATC It Up with Friends international postage! - $10 ★ You'll receive a monthly letter envelope from me! The envelope might contain any combo of : a little note, a random vinyl sticker, an ACEO print, sometimes an original ACEO sketch doodle! - $14 ★ Monthly envelope with a Sticker pack of my newest sticker designs or ones of your choice up to 6. I always add extra goodies! - $20 ★ Monthly envelope with a little handwritten note, likely a vinyl sticker, and one or the other of my choice of either an original drawing or original sketchy or watercolor artist's choice ACEO and sometimes an enamel pin! ❤ You can see my weekly live art & Mail call stream every Tuesday 10:30am PST on my Twitch channel ❤ www.twitch.tv/pabkins ❤ ❤ There is a giveaway raffle every Tuesday livestream to a random viewer and sometimes original ACEO doodle or hand drawn color me cards cards. I hope to see you there! Secured Payments. Support goes to Pabkins's account. We are trying to lower the international shipping rate for our group's Volume 2 artbook - Among the Toadstools! $11.00 ACEO - Simple card This if for a simpler watercolor or marker ACEO card. - Please let me know the theme you'd prefer. Keep in mind I am a fantasy/sci-fi artist. ( I do not draw fan art or NSFW) - 1 character or creature - portrait/bust type pose, I will often draw creatures with most of their body but that is up to my discretion at this level. - Would not have a full background, more like an "atmospheric wash or color" Price includes untracked, uninsured first class letter shipping. If you would like to upgrade shipping please use the add on. $20.00 ACEO - Artist's Choice I often do my best work when I am given the freedom to draw whatever I want in whatever medium I feel like at the moment. So if you want me to decide and feel you love everything I make and would be happy with anything I might create this option is definitely for you and I priced lower as this "artist's choice" method is less stressful for me. What you receive would be a surprise but I will of course show you a picture before I mail if you'd like, that is your decision. Price includes tracked, uninsured shipping. You can add on insurance if you'd like. I am not responsible for lost uninsured mail. $24.00 ACEO - Standard card This if for your choice of watercolor or marker standard ACEO card. - Please let me know the theme you'd prefer. Please keep in mind I am a fantasy/sci-fi artist. ( I do not draw fan art or NSFW) - 1 character or creature - Will have a background. - Do you like bright colors or more mutes rich tones? - I determine the poses and composition but love to hear your ideas. Price is $20, the $4 is for uninsured, first class shipping. If you would like to upgrade to insured shipping use the add on below. 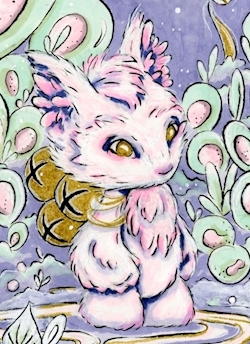 I am available for very limited ACEO (2.5 x 3.5 inch) commissions. Thank you so much for considering a commission with me. Please understand I work best with a theme. You can provide me a theme or character/creature type and some elements of things you like and I will love to create a card for you. What does not work for me is: "I want a girl riding a unicorn, posed with her hand waving in the air, prancing thru a puddle, etc". I am always working on projects and for that reason the expected completion time can be between 1-6 weeks. - I do move commissions to the top of my priority list. - These commissions are for personal use only, - You cannot reproduce it or use it in any commercial way. - I retain all reproduction rights to the art that I create, and I often make ACEO prints. - I will show the sketch before starting - I will show you the final card before mailing - Refunds: if you do not like the card you can request a refund, however I will only refund 75%. - Or you can choose to use the commission amount towards something in my shop (stickers, prints, pins).